The fruit fly has been used as a model organism for more than a century, and, today, it is the most powerful multicellular, genetic model system available for basic and medical research. Fruit flies reproduce and develop at a much faster rate than frogs, mice, or ...humans. At the optimal temperature of 25°C (77°F), a new generation of flies is produced every 10 days. Gene function and genetic pathways can be studied more thoroughly in this invertebrate animal than in any other vertebrate model system. Decades of genetic studies show that the fly is fundamentally similar to other organisms, including mammals, at the genetic, molecular, cellular, and tissue levels. The formation of many organs, including the eye, is controlled by the same genes that control organ development in vertebrates. In a dramatic example of this conservation, the Pax6 gene is required for eye formation in flies, frogs, mice, and humans. 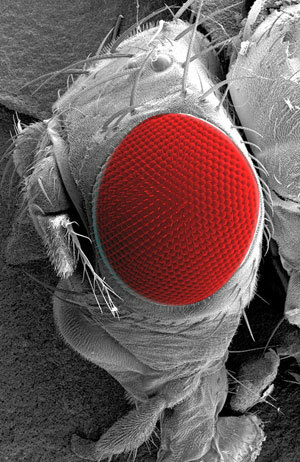 Moreover, the mammalian Pax6 gene can substitute for the fly Pax6 gene and, when activated, can transform other tissues into eyes. In humans, mutations of the Pax6 gene cause several congenital malformations and disorders of the eye, including aniridia, peters anomaly, cataracts, keratits, microphthalmia, and anophthalmia. Over the past three decades, studies in the fly have provided important insights into the function of human genes and valuable leads in understanding the genetic basis of many human birth defects. More recently, the fly model has proven useful in investigating such profoundly 'human' conditions as alcoholism, drug addiction, and neurodegenerative disorders of the brain. As use of the fly model continues to expand, this small organism is now used for large scale pharmacological studies - e.g. for the identification and testing of new drugs. A powerful approach to understanding gene function during development relies on the simultaneous use of invertebrate (e.g. fly) and vertebrate models (e.g. frog & mouse). At the CVR, Drs. Pignoni, Zuber, and Viczian have created an ‘open-lab' environment in which specialists in these three model systems work side by side. Novel findings are routinely investigated across organisms (from invertebrates to mammals) and more quickly related to human biology. Last Modified: April 04, 2018. Contact Carol Miller with questions about the content of this page.